Once again, it’s been too long between posts. Most of October was taken up with putting together submissions for magazines, which cannot be posted about on pain of…well, rejection. I’m also working on a couple of new designs, which are too early in the process to be written about; it’s almost as though exposing them too young will cause failure to thrive. Then November hit, and with it the annual urge to knit ALL the presents. I succumbed this year, against my better judgement, and of course I can’t go posting those projects all over the internets, lest my family see them before their appointed time of unveiling. There is something I’ve been wanting to write about, though, and it contains both spinning and knitting content, so today seems like a good day for it. For the last two years, Clara Parkes (of Knitter’s Review and the most excellent Knitter’s Book of… series) has been hosting a monthly wool-along on Ravelry to go with her Knitter’s Book of Wool. Every month, Clara announces a breed of sheep, with some information about the sheep, fibre characteristics, and sources for wool and spinning fibre. 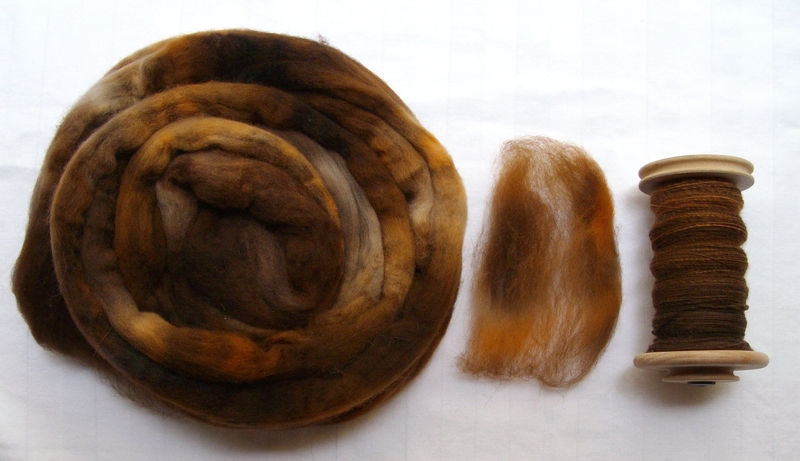 The wool-alongers then go forth and spin and/or knit with that fibre, reporting back on our projects. I’ve been participating since August, when the fact that I was actually spinning that month’s fibre seemed like a sign that I should delurk and jump into the fray. I’m a bit behind, but it’s a casual thing, so being behind is not giving me the squinchy face of too-many-projects anxiety. It’s fascinating to work with each fibre: testing how they want to be spun and knit, finding the best way to show off the different characteristics of each wool, seeing what everyone comes up with. Each wool is different — indeed, the three breeds we’ve covered since I joined are so completely unlike each other that it’s hard to believe they come from the same species. First up, the Gotland. Descended from an ancient Swedish breed, these sheep grow a long, lustrous, wavy fleece in beautiful shades of grey. 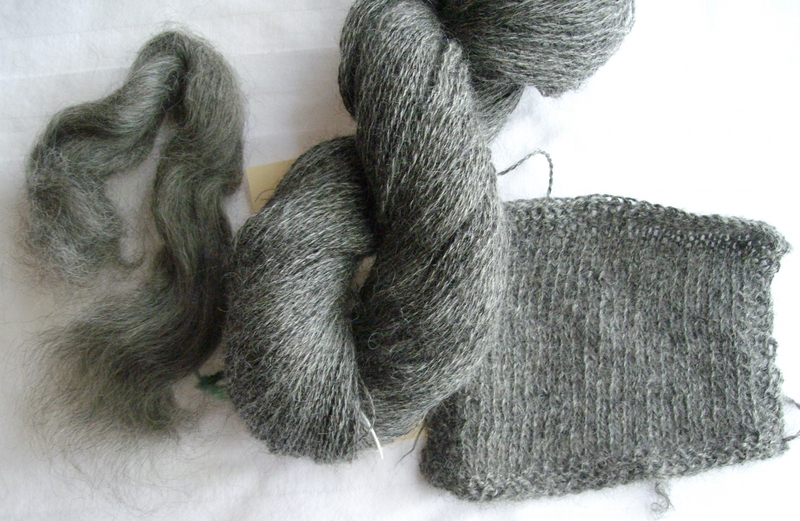 A variant of Gotland, the Stansborough Grey (technically a different breed now, but sharing many characteristics), provided the wool used for the cloaks in the Lord of the Rings movies, which tells you a bit about what the fibre is like. 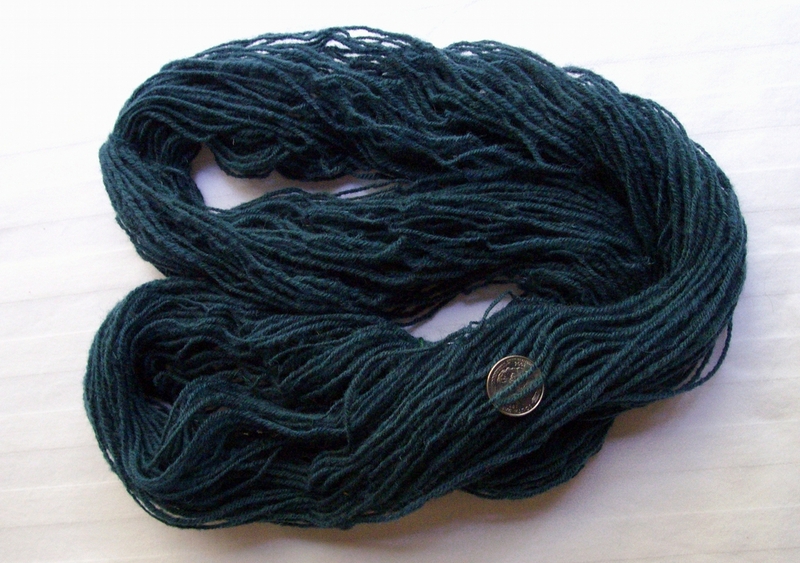 The Gotland top was peculiar to spin. It’s fine and silky with a bit of a wave — unnervingly like hair, in fact — and there was a thin line between perfectly drafted and drifting apart completely. It really, really wanted to be spun fine and semi-woolen: worsted spinning gave me wire, and with its long staple and slippery texture, I do not have the chops to even attempt long draw with this. I went with what worked best, and got a beautiful, light, slightly lustrous, drapey 2-ply yarn that I think will make an elegant wrap. It’s a bit prickly — perhaps I still put in too much twist, or perhaps that’s just the nature of the fibre — so I may edge it with some silk or some dyed Stansborough Grey wool, if there’s any left by the time I get around to buying it. Nov. 19/11 edit: This review says more about the spinner than the spun. I talk about the mistakes I made in this post. This was…interesting. Much as I blather on about softness, I do love a crunchy, wooly wool. I knew going in that Cheviot is more of an outerwear fibre, but the roving I got was, well, unpleasant. The colour was gorgeous, but it felt harsh on the hands and was difficult to draft, and seemed to my inexperienced hands to have an awful lot of neps (tiny, undraftable clumps of fibre). I finally gave up on even singles, ignoring all but the most egregious slubs. “Feh.” I thought, “So this yarn will be rustic. I can work with that.” Cheviot fibre is known for springiness and durability, so I spun a 3-ply worsted style yarn with lots of twist, hoping to make socks. The yarn was indeed springy, lively, and very cushy, and plumped out an amazing amount after a soak but still felt…harsh. Look at the liveliness of this yarn. Seems promising, no? No. 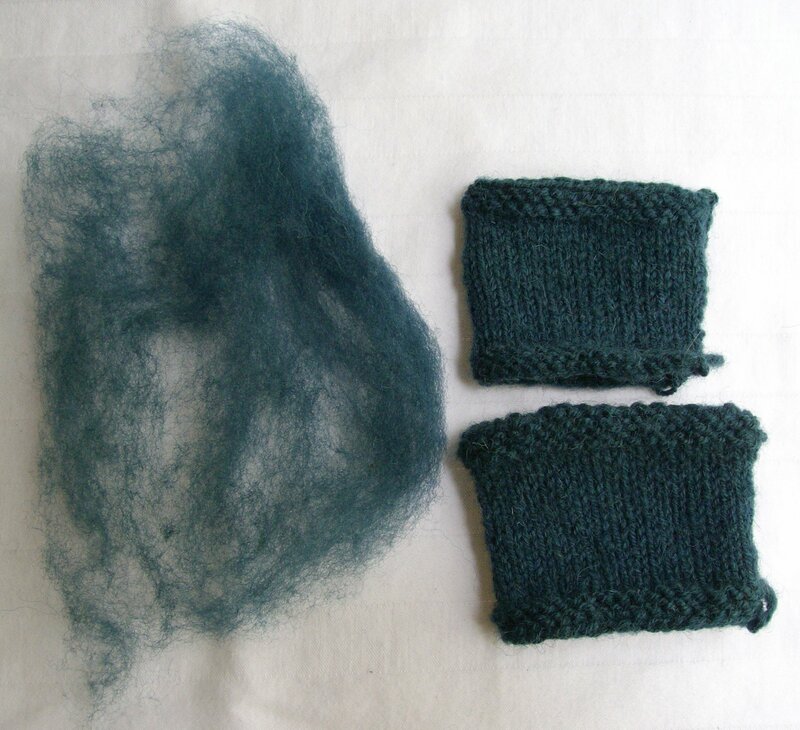 It looked much more even, though, so I pressed on and knit a couple of swatches, since you don’t really know what you’ve got until you’ve knit with it. I did not love knitting with this yarn, and I do not love the final fabric. It’s got the cushiness I was looking for, but retains more than a hint of the Brillo pad. I have some undyed roving that feels softer, so I’ll give that a try and maybe pick up some dyed fibre from another source before walking away, but this yarn? No. I wanted to love it. I tried to love it. I do not love it, and life’s too short to work with things you hate. Oh, the relief I felt upon accepting that realization. Now, I am still new to spinning, and it’s entirely possible that this unlovable yarn is a result of my inexperience and resulting mistakes. If more experienced spinners out there have suggestions, please, tell me. I do not want to be unfair to this fibre. This top came from Two Sisters Stringworks in Vancouver, and great day in the morning, what a difference. I’d read that this fibre can make a fine, bouncy, airy yarn, and the tight crimp seemed like a good candidate for high twist. Yay! Another top to spin long draw from the fold! (Remember that Falkland top? Yeah, like that.) This fibre is so ridiculously soft, and it drafts like butter. It really, really wants to felt, though, so if my hands were even the slightest bit damp (why does this always happen to me with fine fibres? ), the last bits of each section would stick together and become undraftable. Working with smaller bits helps, though. I’ve divided the top into thirds (horizontally, though I’m beginning to wish I’d divided it along its length to keep the colours together), for a 3-ply yarn with an unknown final use. Or maybe a 2-ply. I keep waffling on that. I really want socks, but this is not sock wool — too feltable, too delicate — and we are learning to use each fibre for its best purpose, right? I’m still working my way through this top, but I can tell already that I’m going to love this yarn. Love. It. So there you go. A fibre for everything, and every fibre in its place, though sometimes that place is the Naughty Bin of Oblivion. You can’t love ’em all, and with some batches of fibre, it’s best to just walk away. An elephant in a day?